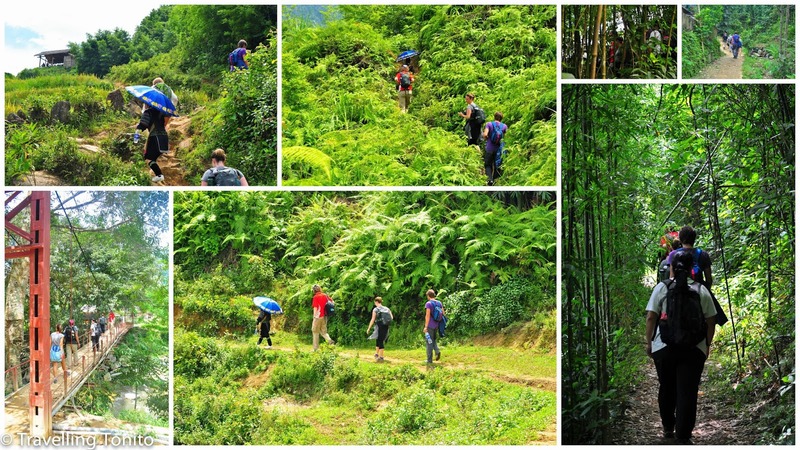 Three days trekking from the centre of spectacular Muong Hoa valley up and down hills you will challenge your feet with hard trekking while enjoying beauty of nature, meeting and making acquaintance to tribal peoples from different ethnic groups to enrich your knowledge with different culture and way of life. You also have chance to experience peoples and especially their hospitality while staying two nights in their homes. Overnight at homestay in Sep Mi Ty village. Continue our trek in the afternoon descending to Ban Ho valley dominated by Tay peoples. Crossing the river by suspension bridge you will walk through this large and well organized village composed by over a hundred large wooden houses built on stilts, enjoying your discovery of the Tay way of life as well as making acquaintance with local peoples. Overnight at homestay in Ban Ho village. Breakfast before back to Sapa. Enjoy the whole day to explore Sapa town on your own. Our recommend is to take a walk to Sapa market, where you can meet tribal ethnic peoples such as Black H’mong, Red Zao, Zay… from nearby villages come every day selling their farming, gathering products: Vegetable, bamboo shoot, mushroom… and of course handicrafts for souvenir. Continue walking the steps from the market to the church and then onto the top of Ham Rong Mountain where you can visit an orchid garden and a small museum about ethnic peoples of the Northwest. You will arrive in Hanoi around 05.00am. Tour finishes. • Accommodation: 3 nights at village.